I'm not the pickiest of coffee drinkers, though if I have my druthers, I like it strong and black. I certainly don't need expensive brands or the freshest of freshly-ground beans. What's important to me is that a)I get my money's worth, and b)the folks who deserve that money actually get it. In addition to a morning cup of joe, I've also come to appreciate the way espresso and coffee bring out some of the amazing attributes of chocolate. These cookies are proof of that--just a dash of ground espresso dissolved in water changes your typical chocolate cookie entirely. The white chocolate chips are there for two fairly obvious reasons--they look pretty and taste wonderful. In a medium, microwave-safe bowl, microwave the bittersweet or semi-sweet chocolate and butter on 100-percent power for 1 minutes. Stir well. Continue microwaving on 50-percent power, stirring at 30-second intervals. Stop microwaving before the chocolate completely melts and let the residual heat finish the job. (Alternatively, in small, heavy saucepan, melt the chocolate and butter over lowest heat, stirring frequently; be very careful not to burn. Immediately remove from the heat.) Let cool to warm. In a medium bowl, thoroughly stir together the flour and cocoa powder; set aside. In a large bowl, with an electric mixer on medium then high speed, beat together the sugar, salt, eggs, espresso mixture, and vanilla for 2 to 3 minutes, or until well blended, slightly thick, and lightened. Beat in the melted chocolate mixture, then the flour mixture, until well blended. Stir in the white chocolate until evenly incorporated. Refrigerate the dough for at least 1½ hours, or until firm enough to shape. Preheat the oven to 350 degrees F. Line several baking sheets with parchment paper. Divide the dough into quarters. Divide each quarter into 5 or 6 equal pieces. Shape then into balls with lightly greased hands. Place on baking sheets, spacing them about 3 inches apart. Pat down the balls just slightly. Bake the cookies, one sheet at a time, in the middle of the oven for 9 to 12 minutes, or until barely firm when pressed in the centers. Reverse the sheet from front to back halfway thought baking to ensure even browning. Transfer the sheet to a wire rack and let stand until the cookies firm up slightly, 2 to 3 minutes. Slide the cookies, still attached to the parchment paper, onto a wire rack. Let stand until completely cooled. Carefully peel the cookies from the parchment. *Disclaimer: Though Puro did send me some samples of their products, these opinions are entirely my own. Gorgeous cookies! Coffee flavored treats are terrific. Me llevo un par de ellas, que ricas galletas. I love coffee and we always make sure to get fair trade, organic, and shade grown/bird-friendly as much as possible! I like one cup a day, but would love to have these cookies. They look pretty scrumptious! I always know that I am really sick if I can't face my morning coffee! It is essential. These look really delicious! I think I rely on caffeine more all the time. And, caffeine and cookie all in one is perfect! The cookies look and sound AMAZING! Agreed, there are much worse things than a coffee dependency. And while I am not a huge coffee drinker (it makes my stomach hurt if I drink it straight), I am an enormous fan of coffee-flavored desserts, so these cookies sound and look amazing! I don't understand it, but while I love coffee in baking or even ice cream, I don't like it in the morning. I think you hit it on the head...bitter. However I don't like it after adding cream or sugar either. Weird. Your cookies look delicious, Grace. I'd love 'em. The white chocolate is unusual with coffee...I like the idea. I'd wake up for a dozen of these. Yum! I am quite the coffee fiend and will wholeheartedly admit that I'm addicted! I like when I can feel good about the coffee i drink...and when I can include it in baked goods! These caffeinated cookies sound super! This looks like something that belongs in a fancy coffee shop! Coffee is probably what I've missed most in my pregnancy. Like you, I like my coffee strong and black! These cookies look just delicious. Thank you for sharing them with us! Although I don't drink coffee, I love its flavor in sweets. These cookies are super tasty! I love cooking with coffee both sweet a savory. As a matter of fact, I'm coffee bring some wings for the weekend "as we speak." I may need to make these cookies for dessert!! P.S. If you get a chance, pop by my blog. I've done a recent post. I need to make some cookies this weekend; it's been a while. I've missed carbs and sugar far too long now. I make a bar cookie I call "Coffee as an Ingredient". There is truly something magical about coffee in baked goods. I'll have to try these the next time my girls are here, in about 2 weeks. I'm an iced coffee fanatic! 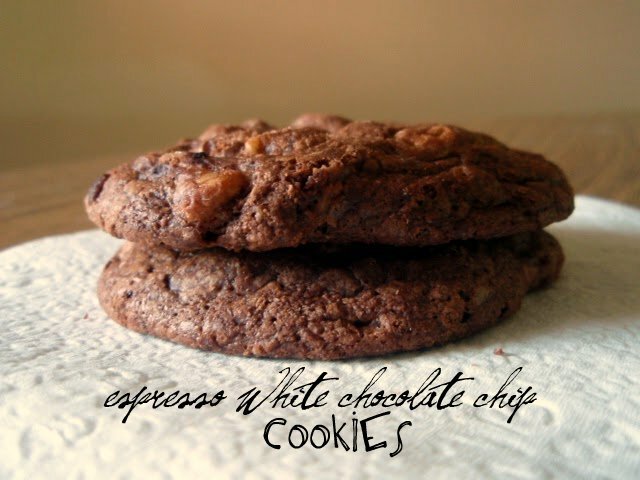 These cookies look wonderful :) I'd love to try them and this coffee! I too have no interest drinking of coffee anymore since the time I got headache for sipping a cup of it. However, eating foods containing caffeine is a whole different story. I love cookies and will never let caffeinated cookies just pass by without taking one or more pieces top satisfy my cravings. Oooh, caffeinated choc-chip cookies! Yes, please :) How ya been Grace? I've missed reading your blog. Got a lot of catching up to do.